It's only been about a month since the last beta relase but it felt more like three. Been working on how to make it even easier for you guys to add/remove software players, so here it is. This feature is protected behind the Snakeoil tab and only available to people who has activated their Snakeoil OS. Note that this is very much an experimental feature so please let me know if there are any issues. Ability to install/uninstall most software players from the Snakeoil tab now. Select Install to have the player show up in the Software tab or Not Installed to uninstall the player from the computer and not shown in the Software tab. 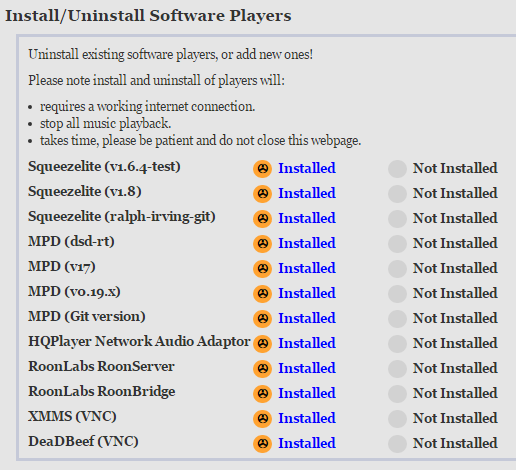 Not sure if this is related to the new firmware but for some reason I cannot use the squeezeplayer anymore. It doesn't seem to recognize my DAC as a player. However MPD works fine. Hmm that's an interesting one.. I'd check that later tonight and see if I can reproduce this. Edit: Got a massive headache last night so didn't get to try this. Will be in touch on this..
@Leonard I couldn't replicate this for some reason. Can you try and set the player to v1.8, and then try reboot the computer and see if squeezelite works?